The Greek Softball Federation is proud to announce Jimmy Kolaitis as the Women’s National Team Technical Advisor! 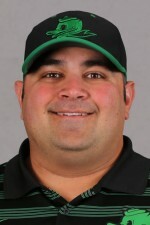 Mr. Kolaitis is currently the Assistant Coach at the University of Oregon. Kolaitis helped the Ducks to Pac-12 titles and Women’s College World Series appearances in both 2014 & 2015. Jimmy has made a huge impact in his first two seasons with the Ducks, helping UO’s hitters shatter records in 2014 & 2015. For a complete bio please read more at GSF National Teams, Coaches.